As you have likely heard, there are serious talks about rebooting the X-Files as a television show. Both Gillian and David have expressed interest in returning for the project, so if it happens we'll very likely see Mulder and Scully on the small screen again! 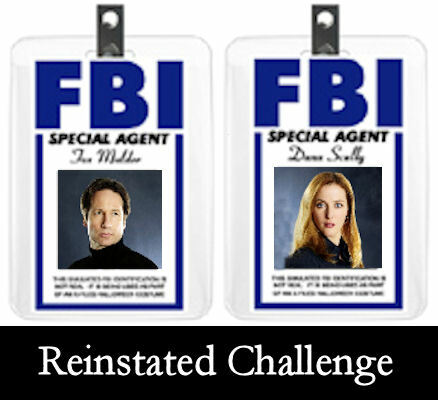 So, in honor of that, we present the Reinstated challenge. You mission, if you choose to accept it, is to write a post-IWTB fic that illustrates your idea of how Mulder and Scully will (or should) return to the X-Files after so many years away. * Your story must include William as a significant character. He doesn't need to live with Mulder and Scully (although he may) nor does he need to be the reason they return to the X-Files (but again, he may be), but he should be part of your story. That's it. As always you're welcome to include other kids (both character offspring or unrelated); to bring Skinner, Doggett, Reyes and/or Gibson into your story, this story can be a sequel to an earlier post-Truth or post-IWTB fic you've already written; and this challenge is also eligible for the Take Two Challenge as well.